Six-wicket hero Cleon Reece was Rye Cricket Club's Concepts of Rye man of the match in the victory over Crowhurst Park. Rye Cricket Club’s first team consolidated its place at the top of the table with a derby victory on Saturday. Harry Smeed’s side won by five wickets at home to local rivals Crowhurst Park to remain 10 points clear at the Sussex Cricket League Division Four East summit. In a match sponsored by My Sweet Old Etcetera, Rye captain Smeed lost the toss and his team was pleased to be asked to bowl. New ball pair Cleon Reece and Tobias Farrow bowled well in their opening spells, reducing Crowhurst Park to 57-3 with Reece taking all three wickets. Craig Pierce was introduced into the attack in his first game for the front side this season and bowled extremely well to rip through the Crowhurst Park middle order with great figures of 3-34. A mini recovery from Sam Hobbs (36) and Josh Jones (14) lifted the visitors from 68-6 to 118-6 before George Wathen dismissed the latter. Smeed decided to reintroduce Reece to the attack and he put in a Concepts of Rye man of the match performance to take the last three wickets in an over and finish with superb figures of 6-31 as Park were all out for 120. Rye’s chase got off to a rocky start with Clive Tong picking up two quick wickets to leave them 19-2. Smeed made a quickfire 21, but when he was dismissed, Rye were 42-3 and in need of a partnership. 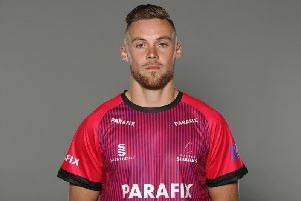 They duly got one from Wathen (32) and Dan Seabrook (53 not out), who both batted with patience and an attacking mindset when the opportunities were there. Rye lost a couple of wickets late on but passed their target five down to claim 30 vital points and keep their unbeaten record going. Standings (all played 8 matches): 1 RYE 185pts, 2 Rottingdean 175, 3 Buxted Park 172, 4 St Peters 165, 5 Cuckfield II 127, 6 Glynde & Beddingham 126, 7 Mayfield II 125, 8 Bells Yew Green 118, 9 CROWHURST PARK 110, 10 Hellingly 85.